Bought this ages ago, played it once, didn't think much of it, stored it... I might not have been paying enough attention. 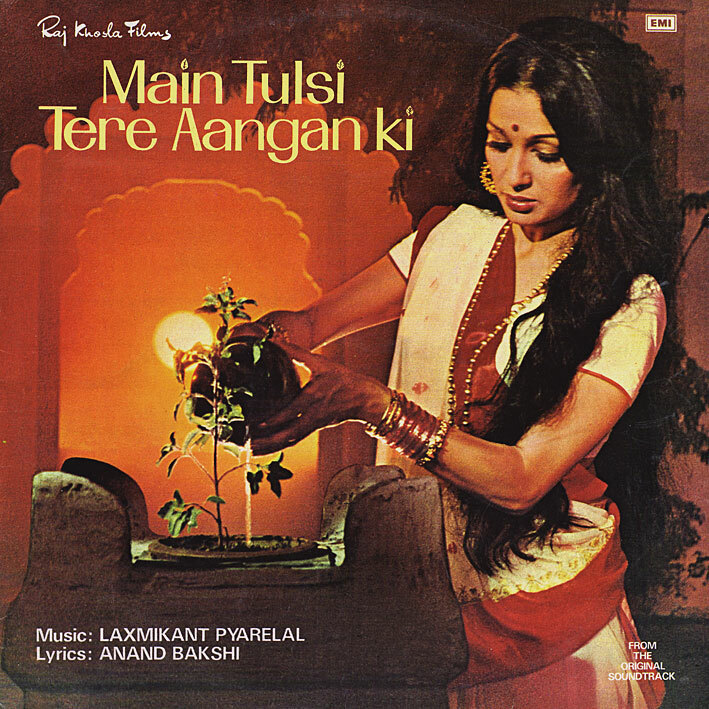 Because listening to it now, I'm thinking 'Main Tulsi Tere Aangan Ki' is quite alright. Most of side one is Lata Mangeshkar, singing the title tune and several variants thereof - pretty, if maybe on the saccharine side in the long run. Side two has more variation; I like the traditional, sparsely arranged 'Saiyan Rooth Gaye', and most of all the excellent 'Music' - an instrumental not entirely dissimilar in tone to the ones on 'Anita'; starting off very dramatic like something from a 50s horror movie, ending in funkier territories like James Bond in Bombay - excellent stuff! It should have been longer though. Thanks PC. This blog is just awesome !!! I like that Shobha Gurtu. She reminds me of Abida Parveen. I'd love to hear more. I was very surprised to actually like this film, even though it's filled with sacrifice blah blah...:-) but anything with Vijay Anand in it is okay with me! Thanks, could not find this anywhere!